Join fellow quilters for a special tour of Four Amazing Quilt Stores! 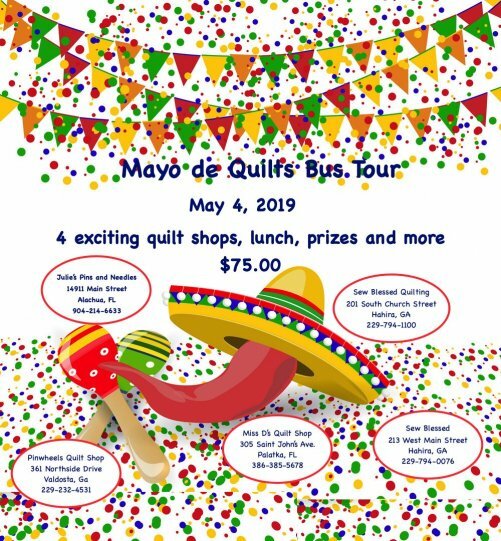 Registration fee includes your transportation on a luxury coach, lunch, drawings/prizes and special pricing plus a fun filled day with a group of people who love fabrics/quilting/shopping as much as you do! Deposit of $50.00 will hold your seat. Cancellations 30-60 days prior to departure will receive a 50% refund. No refund will be given to any cancellations within 30 days prior to the departure date. Payment is confirmation of your booking. Reservations made after April 15, 2018 must include full payment. Credit cards and checks are accepted. Funds for checks returned for any reason must be returned by overnight mail in the form of a certified check or money order and must include a $50 return check fee. Travel insurance will be covered by the bus company that is providing transportation. Obtain reservation form by clicking on postcard above for bus tour and either email or snail mail into shop.